On January 23, 2015, we had a Q&A Interview with a leading expert on goal attainment and mental contrasting and author of the new book, Rethinking Positive Thinking: Inside the New Science of Motivation, psychologist Gabriele Oettingen, PhD. Gabriele Oettingen draws on more than twenty years of research in the science of human motivation to reveal why the conventional wisdom falls short. The obstacles that we think prevent us from realizing our deepest wishes can actually lead to their fulfillment. Starry-eyed dreaming isn’t all it’s cracked up to be, and as it turns out, dreamers are not often “doers” because they have already visualized their dreams as accomplished. Positive thinking is not a bad thing, but it’s not enough to motivate action for intermediate goals, especially when the going gets tough. While optimism can help us alleviate immediate suffering and persevere in challenging times, merely dreaming about the future actually makes people more frustrated and unhappy over the long term and less likely to achieve their goals. We do gain pleasure from immersing ourselves in positive fantasy, yes, but this allows us to feel good and fulfill our wishes virtually, thereby sapping our energy to perform the hard work of meeting challenges and achieving goals in real life. Positive thinking alone can stall motivation to keep working on goals. So what else is needed? An internal motivation system can be best engaged by contemplating both a desired future as well as all the obstacles that stand in the way. Based on her groundbreaking research and large-scale scientific studies, Oettingen introduces this new way to visualize future goals and wishes as “mental contrasting.” It combines focusing on our dreams with visualizing the obstacles that stand in our way. By experiencing our dreams in our minds and facing reality we can address our fears, make concrete plans, and gain energy to take action. She also recognizes the power of setting up implementation intentions, or “if-then” plans, to cue specific action steps to overcome the identified obstacles. In Rethinking Positive Thinking, Oettingen applies mental contrasting to three key areas of personal change– becoming healthier, nurturing personal and professional relationships, and performing better at work. She introduces readers to the key phases of mental contrasting using a proven four-step process called WOOP–Wish, Outcome, Obstacle, Plan–and offers advice and exercises on how to best apply this method to daily life. Through mental contrasting, people in Oettingen’s studies have become significantly more motivated to quit smoking, lose weight, get better grades, sustain fulfilling relationships, and negotiate more effectively in business situations. Whether you are unhappy and struggling with serious problems or you just want to improve, discover, and explore new opportunities, this book will deepen your ideas about human motivation and help you boldly chart and take action on a new path ahead. “Gabriele Oettingen approaches the subject of positive thinking with a scientist’s passionate curiosity. She is open to anything she might find and truly seeks to discover what works—and what doesn’t. What she found will surprise you, as it did me, and will make you eager to try her methods.” — Florian Henckel von Donnersmarck, writer, director (The Lives of Others; The Tourist), and winner of Academy Award for Best Foreign Language Film. Gabriele Oettingen, PhD, is a Professor of Psychology at New York University and the University of Hamburg. She is the author of over 100 articles and chapters on goal setting, goal engagement and commitment, self-regulatory processes that affect commitment and disengagement, thinking about the future, and the control of cognition, emotion, and behavior. She was educated in Germany and received her PhD from the Ludwig Maximilian Universitat in Munich and the Max-Planck-Institute for Behavioral Physiology in Seewiesen, Germany. Gabriele has extensively documented the limitations of relying primarily on positive thinking for goal setting, motivation, and achievement. Over the last 20 years, she has developed, refined and tested strategies involving a more complex process called Mental Contrasting that consistently demonstrates more successful progress towards and attainment of everyday and long-term goals. When desired goals or fantasies are paired with realistic appraisals of perceived obstacles that might interfere with achieving them, there is more likelihood for energetic, active planning to overcome the hurdles. Gabriele’s research suggests that Mental Contrasting can be especially effective when chances of success are perceived to be high, and can also help people disengage from their goals and replace them if they have little confidence that they can achieve them. Gabriele’s research has been published in professional journals for social, personality, developmental and educational psychology, in health and clinical psychology, in neuropsychological and medical journals and in popular media. Her findings contribute to the burgeoning literature on life style change, coping mechanisms and managing stress, and businesses and institutions have become increasingly interested in the application of her research. 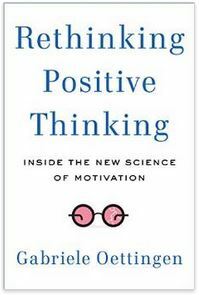 Gabriele’s first trade book, Rethinking Positive Thinking: Inside the New Science of Motivation, was published in October, 2014 by Current, an imprint of Penguin Random House. She has developed a WOOP website and designed an app built around her research findings, so that the highly successful WOOP inquiry process can be applied to goal setting, planning, and attainment within educational, institutional, and business settings as well as personal life. Gabriele lives and works in New York City and in Hamburg, Germany. She credits her husband, Peter, and her two sons, Anton and Jakob, with supporting her “offbeat” ideas about effects of optimism on goal attainment and the development of more effective alternative approaches now substantiated through research. Gabriele’s website at New York University, with research summaries, publications, contact information. Click on AUDIO at the top to try out the WOOP process. Click on APP at the top to find out about a phone App that teaches WOOP and records and monitors progress towards goals. Click on SCIENCE for a full list of Gabriele’s professional articles.